Case IH offers a range of farm equipment designed to assist precision agriculture operations. The larger the operation, the more important precision becomes; with its ability to save time and input costs multiplied across hectares, an upfront investment in precision agriculture can be repaid very quickly, as Paul and Katie Messina have found. Paul and Katie Messina are at the forefront of Western Australia’s precision agriculture movement. They plan their strategy carefully, take on board research and development findings, have built-up solid relationships with employees and suppliers, and are now reaping the rewards. Paul and Katie farm 10,000 hectares at Tenindewa in the mid west of the state and crop around 9,000 hectares of cereal wheat, lupin and canola using techniques that even their Case IH dealer, Steve Purcher from Purcher International in Geraldton finds innovative. “It was Paul’s requirement for a loan GPS base station years ago that really opened our eyes to what could be done with technology and now 95 per cent of my customers are going down the precision agriculture path,” said Steve. Paul explains how the Messinas took up precision agriculture. 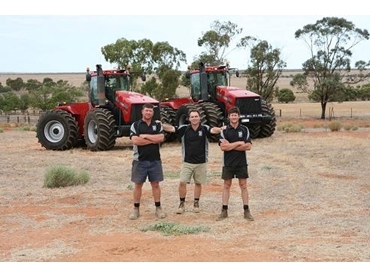 Paul has a fleet of machines that support his precision agriculture approach, last year alone buying three new Case IH Axial-Flow combines, two 7120s and an 8120 as well as two Case IH Steiger 535 model tractors. He also uses four Case IH AFS Pro 600 monitors, the portable monitors that can be used to record data and guide equipment in his farm vehicles, even fitting a monitor in his UTE to do soil analysis and boundary mapping. Paul and Katie employ up to six seasonal employees during peak times, in addition to two full time employees. In the past, much time was spent explaining not only the mechanical side of the machines, but also how the software worked. But things have now changed and they believe that the Case IH AFS Pro 600 monitors are responsible for last year’s increase in efficiency. Farm profitability also benefits from the data gathered by the AFS Pro 600 monitors. In large paddocks, GPS-enabled auto guidance comes into its own, ensuring precise lines and eliminating overlap. The Real Time Kinematic (RTK) system, which uses different types of satellite signals to deliver repeatable accuracy of up to 2cm is superior to the standard GPS system. RTK systems rely on a base station and one or more remote receivers. Secure RTK is a remote monitoring feature than can be enabled on Case IH RTK base stations. By adding a cellular modem, the base station can report on its own status and local conditions such as signal strength.